Sandy Key’s beaches are forever protected by the neighboring National Seashore Preserve. If you prefer your walks on the beach, solely in the company of the sea gulls, Blue Herons and sea shells, then Sandy Key is the place for you. Sandy Key is located on 800 feet of Beach Front. 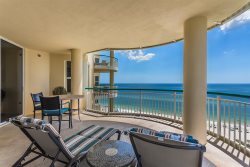 This unit has 1219 SF of living area and a 200 SF beach front balcony. Carpet throughout Living, Dining and Bedrooms with Ceramic Tile in Foyer, Kitchen and Baths. Electronics include 20” TV, DVD, CD-Stereo in Living Room, 19” TV in Master Bedroom. I have used Perdido Realty many times. Valerie has always gone above and beyond to help me with my vacation plans. She is a complete pleasure to work with and a wonderful asset to your company. I have referred many people to Perdido Realty and will continue to do so. Thank you! What a wonderful condo. We hope to come back every year!